(NaturalNews) Fresh research on the neurological condition known as Parkinson's disease has affirmed what a number of prominent scientists have been saying for several years now: Mainly that pesticide exposure is a direct cause of this widespread degenerative health condition. And while there are admittedly many other potential causes and triggers of Parkinson's, this obvious exposure is one that needs to be taken more seriously moving forward, admit some. All in all, 104 studies were included as part of the new review, each one varying in its evaluation of exposures to weed, fungus, rodent, and bug pesticides, as well as to chemical solvents. Some of the studies also looked at things like proximity to pesticide exposures, whether they be on the farm out in the country or on produce at the grocery store. Analyses of exposures via well drinking water and other sources were also included. After reviewing this cohort of research, which dates back to as early as 1975, scientists from the IRCCS University Hospital San Matteo Foundation in Pavia, Italy, discovered that overall, exposure to pesticides is linked to an astounding 58 percent increased risk of developing Parkinson's disease. Published in the journal Neurology, this same review also notes that, based on the research as a whole, this percentage may actually be as high as 80 percent. "Due to this association, there was also a link between farming or country living and developing Parkinson's in some of the studies," explained Dr. Emanuele Cereda, lead author of the new study, in a press release. Though Dr. Cereda and his colleagues did not specifically evaluate the delivery method of pesticides as it pertains to Parkinson's risk - such methods include inhalation, absorption through the skin, and oral consumption - they did observe a very precise dose response association. 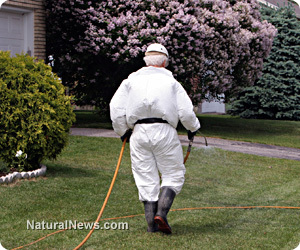 In other words, the more pesticides a person is exposed to, the higher his risk of developing Parkinson's. "We didn't study whether the type of exposure, such as whether the compound was inhaled or absorbed through the skin and the method of application, such as spraying or mixing, affected Parkinson's risk," said Dr. Cereda. "However, our study suggests that the risk increases in a dose response manner as the length of exposure to these chemicals increases." According to the latest statistics released by the National Parkinson Foundation, as many as 60,000 new cases of the disease are diagnosed every year in the U.S. Parkinson's is also the 14th leading cause of death in the U.S., which means identifying its cause is of utmost importance. And thanks to the new research, we now have a firmer foundation upon which to advocate against the use of dangerous pesticides and other chemicals. "I think the study is actually a big advance in our research knowledge of the relation between chemical exposures and the basic neurological injuries," says Dr. Arch Carson, an associate professor at the University of Texas (UT) School of Public Health in Houston, as quoted by Medpage Today. "This report is the first to show that there is a positive relationship between not only insecticides and herbicides but also some other solvent chemicals to which many people are exposed and the development of Parkinson's syndrome."